Sometimes you read an author's works and you just don't get it. You don't understand why they're famous, you can barely slog through their overworked prose, you don't connect with their words at all. And then sometimes... sometimes it just clicks. You read their thoughts, the words they put to feelings you experience daily, the thoughts that have been nagging at you for as long as you can remember, and you're certain that had the fabric of space and time been folded differently, the two of you would have been great friends. For me, one of those authors is Jane Austen. Previously, I showcased Mr. Darcy as the poster child for a healthy INTJ, claiming that the reason he's such a good example is because I believe Jane Austen herself was an INTJ. No one else could have so convincingly and subtly written one without making him the villain, and I don't think I've ever so strongly identified with a character as I have with Mr. Darcy, regardless of the fact that he is male and lived approximately two hundred years before me. And, after doing some research into Jane Austen herself, there are very few authors I identified with so completely. Maybe C.S. Lewis or Lewis Carroll, who, wait for it, were also INTJs. Jane Austen's novels were the novels of her day, albeit with a smarter and more timeless bent. They were romances, set in country estates, revolving around balls and letters and misunderstandings. But more than that, her novels were written in such a way to stand as stories while critiquing the more flighty and silly novels that were being published and lauded. Her characters were mockeries of both popular characters and people she knew, and her novels themselves mocked the conventions expected of women and society in general at the time. "Oh! It is only a novel!” replies the young lady, while she lays down her book with affected indifference, or momentary shame. “It is only Cecilia, or Camilla, or Belinda”; or, in short, only some work in which the greatest powers of the mind are displayed, in which the most thorough knowledge of human nature, the happiest delineation of its varieties, the liveliest effusions of wit and humour, are conveyed to the world in the best–chosen language." Northanger Abbey, from which this quote comes, is a parody of a Gothic novel, one of the popular genres of the day. The heroine fancies her life to be like a Gothic novel, and Austen spends the entire book mocking her, and thus the notion that girls shouldn't read novels, for it. She is repeatedly shown to be completely oblivious to life--in short, the type of girl society supposed would read novels. Of course, for an author of novels, this was absurdity to the highest degree. "The person," she writes in this same novel, "be it gentleman or lady, who has not pleasure in a good novel, must be intolerably stupid." Preach it, Jane. 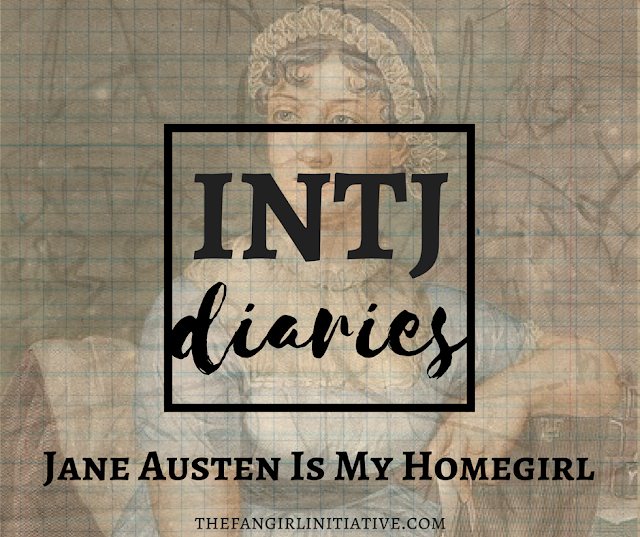 But of course, the bulk of her personality, her beliefs, and her wit is going to come through in her letters, particularly those to her sister Cassandra, which I referenced at the beginning of this article, as they constitute what would have conceivably been in Jane Austen's diary. It's speculated that Austen wrote near 3000 letters over the course of her life, but most were burned, cut, or destroyed, lest people, especially younger relatives, should be privy to her scathing remarks concerning people they knew. Only about 160 letters were preserved, and, given what's in those letters, I can hardly imagine what was destroyed. She has no tact and doesn't care one whit if other people know it. She grabs onto the absurd and presents it with such sincerity that if you weren't looking for it, you'd have hardly noticed it. If you know an INTJ, watch them. They'll do this a lot. She must have looked at her husband. Ouch. But it's also funny, almost shockingly so. It's unexpected; it makes light of serious subjects. If you keep watching your INTJ, you'll notice that they do this a lot, too. We don't feel deeply about things that don't affect us; if we did, we'd lose all sense of perspective and probably spiral into a deep depression. So we make light of things that shouldn't be made light of, much to the shock (and sometimes awe) of those around us. INTJs are also master people watchers. While many of the types--especially the types that choose writing as a profession--take up people watching, few, if any, can approach it with uncanny accuracy that an INTJ can. We treat people watching as we treat every other aspect of our lives: with scientific accuracy, holistic knowledge, and an all-consuming interest. We see patterns in people; we get good at predicting how someone will react to any given scenario, testing ourselves when out and about and refining our knowledge when we're wrong, until we're no longer wrong. It helps that we're immune to emotional manipulation. Where another type might feel empathy, sympathy, or some other feeling that would trump thought upon seeing a person crying, an INTJ without a conscious decision to act otherwise would feel mostly detached curiosity. This is how Jane Austen saw life, how she was able to wrap people into her novels, caring for them while also mercilessly mocking them, but never--never--turning them into caricatures. Her people were always believable people, regardless how many flaws she gave them. But no matter how accurate to life her characters were, she could never treat them with anything more than she treated people in real life. She noticed everything about people: she noticed their sins, their quirks, their follies, their strengths. And rather than harshly judge them for it, she simply saw it all as amusing. People are people, and people will always continue to be people. What good is it to do anything but laugh? I feel this sentiment to my soul. The feedback in almost every writing class I took was to add more emotion to my stories, to treat things seriously, to make the reader feel everything. And no matter how much I tried, I couldn't make anything I wrote sound completely serious without also sounding completely hokey. I wish Jane Austen had been there to tell me that it was okay, that I could take my deeply unserious stories and turn them into something great, something filled with emotion that not only made readers today feel, but readers two hundred years later. Austen's brother Henry tells us, "She became an authoress entirely from taste and inclination." She saw that the serious romances of the time weren't of interest to her, so she wrote her own. She wrote what entertained her, and it entertained everyone else as well. INTJs tend not to believe in the word "impossible." If we see something that we don't like, and we care enough to fix it, we will. It's as simple as that. In the first chapter of Northanger Abbey, the narrator says, "Strange things may be generally accounted for if their cause be fairly searched out." This is an INTJ's mindset in a nutshell. It is an obvious truth to Austen, who tucks it neatly in the middle of a particularly satirical passage. It is in this searching and accounting for things that Austen's writing really shines. Not only does she people watch like a pro, she learns their motivations and their place within society--not in the society that claimed women shouldn't write novels, but the society that existed in her mind, the practicalities of everyday life. And thus her characters practically jumped off the page. INTJs aren't concerned with the particulars of life, the small details of society that have no bearing on them personally. Sherlock doesn't care that the earth revolves around the sun. Mr. Darcy doesn't like to dance. Jane Austen cared not at all that women in her society were supposed to be proper, were supposed to refrain from reading novels. There was a war going on as she wrote most of her novels, but the most mention she makes of this is when it affects one of her characters directly: when the militia is in town, for example, bringing lots of eligible young men. She wrote about human nature, the one thing that will endure as long as humanity is around, and moreover she understood human nature, and so her novels are timeless. But, like most INTJs, the fact that she understood human nature simply meant that she liked it less. She is cantankerous and constantly annoyed with humanity, the fate of many an INTJ, and she knows it. There is a weird paradox that exists between INTJs and people: we're angry, bitter, conceited, and a great many other negative adjectives, and yet, because we're aware of this fact and treat those emotions with the same indifference we show the rest of our lives, people like us for it. I still don't totally understand it, other than the "you're so funny!" comments I get on the regular. "You deserve a longer letter than this; but it is my unhappy fate seldom to treat people so well as they deserve," (1798) she writes, and yet her brother said of her, "No one could be often in her company without feeling a strong desire of obtaining her friendship." Maybe this disconnect comes from the loyalty INTJs display once they've deemed someone worth their time. Loyalty might even be the wrong word for it. It's a stubborn affection, a commitment to like a person and enjoy their company for conceivably ever, unless something happens to cause the INTJ to cut ties completely. Once an INTJ likes you, however, this is very very very unlikely. Austen writes this in Northanger Abbey, but it may as well have come from her letters. All her words are colored with the fact that she cares very little for the people of the neighborhood that she so scathingly writes about, but she would do anything for those she loves: her sister Cassandra, for example, or her niece Fanny. I sometimes like to think of Jane Austen as the nice lady down the street who takes care of widows and orphans, is always nice to her neighbors, and yet, just to entertain you, tells hilarious stories about people, nailing their personalities, quirks, and flaws, and weaving a world in which humanity’s foolishness is no more harmful than a few hurt feelings and awkward situations. It’s not for no reason that Austen aficionados refer to her as "Aunt Jane." She of course had all the typical INTJ quirks and faults, as well. She thinks herself brilliant and exceedingly witty: "Expect a most agreeable letter, for not being overburdened with subject (having nothing at all to say), I shall have no check to my genius from beginning to end." (1801) Though, to be fair, she was both of those things. She has incredibly high standards for not only the people she meets (few measure up, as you can tell by her writings), but for a romantic partner as well. She loved one man, did not marry him because it was impractical for both of them, and no one ever quite measured up to him again, and so she died unmarried. While some of her novels may seem boring or clichéd to the uninformed reader--the reader, perhaps, who has not pleasure in a good novel--they show a complex and intelligent woman who understood life and let it amuse her. In an outline to one of her novels, she details her heroine, in all her moral and worldly glory, then she writes, "Heroine must meet with the Hero—all perfection of course." Accurate to every girl’s fantasy, the female protagonist is complex and wonderful, but the hero doesn’t have any recognizable features: he is simply perfection. Of course. She gives no cares whatsoever about what is proper, what is expected of her, what is societally correct. She is an INTJ to the core. I have much more I could say about Dear Aunt Jane, I could laud her merits and her wit for days. (Possibly quite literally, though I've never tried.) But, as I cannot decide what else is important enough to add as everything about her is so equally wonderful, I will go eat with an episode of Arrested Development. 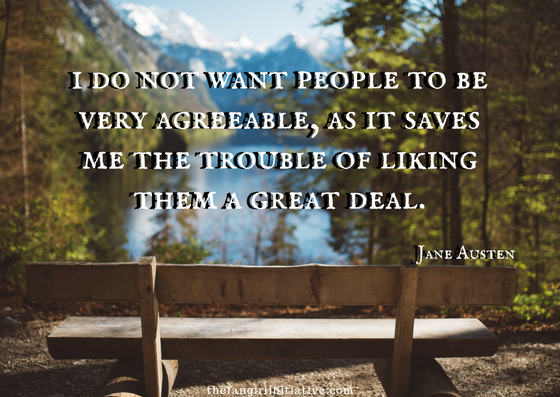 What do you love most about Aunt Jane? I love this post so much, I can't even. The way you write about Jane Austen really makes her come alive, and I'll admit, it took me awhile to get used to the satire of her work, but once I did, it has become some of the most amusing writing I have ever read. Aunt Jane is a queen! Thank you so much! It took me a while to get into it as well, but once I did I couldn't imagine not loving her. She's the best.